While there are many text editors out there offering a broad set of features my favorite right now is EditPlus. The list of features is long and every revision brings more. Check out the Features page for more. 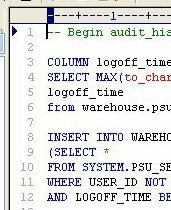 I’ve been using the Oracle 9iR2 syntax file from the user files section of EditPlus.com and it seems to pick up all the SQL and PL/SQL syntax I use, although many other syntax files exist and you could always make your own. As mentioned above, EditPlus is shareware. A single user license is only $30, and with discounts for buying in bulk there is no reason not to pay, but for now, download it, try it, and see why you can’t live without it. Thanks to Zach for showing this to me a couple years ago.